input, but you have no signal or you can use it to test your GPS applications. It supports various NMEA 0183 sentences, so it can be used with any GPS mapping software. It operates in two modes: simulator mode and file mode. In simulator mode the latitude and longitude coordinates are periodically incremented with a defined step. 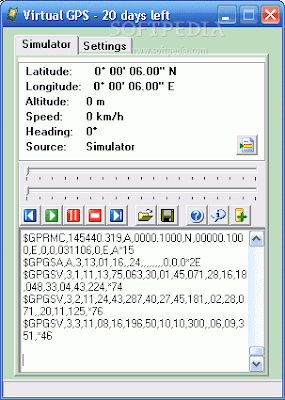 In file mode the GPS data is loaded from a text file which contains NMEA 0183 sentences. serial ports like: Virtual Null Modem, Virtual Serial Port Driver, Virtual Serial Port Kit, Advanced Virtual Com Port and others. Another possible application of the software is to broadcast the output of the simulator through bluetooth.